Are Expenses Eating up Your Retirement Nest Egg? Home > Resources > Truepoint Viewpoint > Retirement Planning > Are Expenses Eating up Your Retirement Nest Egg? All mutual funds and exchange-traded funds (ETF) carry a management fee. The fee is percentage-based and referred to as the expense ratio. This percentage is stated in annual terms though the fee is pro-rated and debited each business day from the fund’s assets, thus lowering the return to the fund’s investors. Fund fees can represent a significant cost to investors over time, so it is important to understand and compare fee levels before investing – especially given that fees vary widely across different types of funds. The chart below highlights the range of fees investors may encounter. Not surprisingly, actively managed funds charge higher fees than passively managed funds. It may be surprising, though, to see how much higher the fees are. 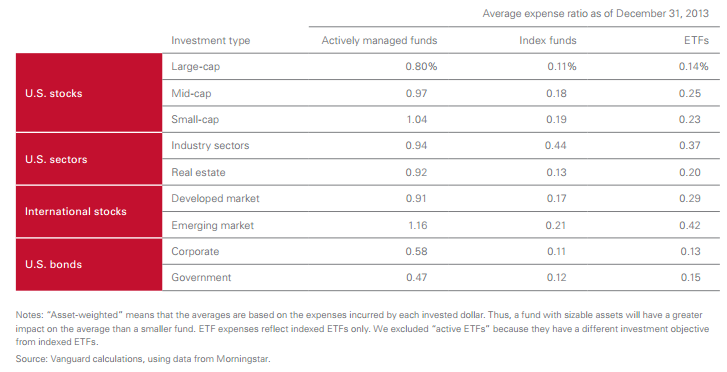 For the range of funds listed below, actively managed funds on average charged fees five times higher than the average index mutual fund and four times higher than the average ETF. There can also be considerable fee differences across market segments. In general, large-cap stock funds have lower fees than smaller-cap funds, and developed market funds have lower fees than emerging market funds. Although we see there is a difference between expense ratios in the chart above, there may be a tendency to think the difference will be of little consequence to the overall portfolio since, in absolute terms, the expense ratios are all rather small percentages. This is not the case, though. Just as the compounding effect of time works to multiply asset growth, so too does it multiply the effect of expenses. So, over time, higher expenses will have a greater and greater negative effect on net return, and vice versa. The chart below illustrates the significant impact the fee gap can have over time on a portfolio. This example compares the net return of an actively managed fund (with an average expense ratio of .80%) with an index fund (with an average expense ratio of .11%), both investing in U.S. large-cap stocks, assuming an initial investment of $100,000 and an average return of 6%. Over 30 years, the difference in the expense ratios results in a net return of nearly $100,000 more for the investor who chose index funds versus actively managed funds. That is equal to the entire initial investment! Alternative investments — such as private equity or hedge funds – have fee structures that are more complex and even more expensive than traditional mutual funds and ETFs. Often these alternative investment options charge not only a 2% annual management fee (which is higher than the typical actively managed fund), but also take a 20% share of the fund’s profits. As you can imagine, these costs create significant hurdles for the investment to overcome if it is to generate a competitive net return. Recently, many institutions and endowments have realized this as many of their allocations to alternative strategies have underperformed the broad market. In fact, the California Public Employees’ Retirement System (CalPERS), the nation’s largest public pension fund, recently announced plans to eliminate its entire hedge fund program, valued at roughly $4 billion, largely due to unjustifiably high costs. At Truepoint, we believe it is incredibly important to understand the costs of any investment strategy. We attempt to take advantage of any opportunity to cut expenses within the portfolio — as long as it doesn’t have a negative effect on the expected long-term performance of the portfolio. Happily, industry trends have generally pushed expense ratios lower over time, and we have been able to further reduce costs through thoughtful portfolio construction and the utilization of lower-cost institutional share classes of mutual funds. Our efforts have been fruitful. Even from a starting point much lower than the average actively managed portfolio, we’ve been able to further reduce the weighted average expense ratio of our recommended portfolios over time. For example, the underlying expense of a typical 70% stock portfolio at Truepoint has dropped from 0.32% in 2009 to 0.23% today. And be assured that lower fees don’t indicate lower quality investments. In fact, from December 31, 2000 through June 31, 2014, Truepoint’s 70/30 portfolio has outperformed 89% of the funds included in Morningstar’s Moderate Allocation category. Clearly, the effort to keep costs low improves net returns. If you’re interested in understanding more about the expense ratios in your portfolio, or have any other questions, your Wealth Advisor will be happy to help – just give us a call.